Ultra-violet: Concorde 07 features violet mirrored lenses in a matte black wire frame with Tokyo tortoise acetate temples. The bronze ceramic nose pads are hypoallergenic and reclaimed walnut side inlays complete the look. Take to the sky: We set out to create the perfect aviator sunglasses using only the finest materials and best craftsmanship. Each frame is meticulously handmade in Japan and features high-quality shatterproof lenses with 100% UV protection. The Concorde shape was designed to be comfortable and flattering on all face shapes. Its wire-core acetate temples are highly adjustable and provide a more comfortable and substantial feel than traditional all-wire temples. Its surgical-grade stainless-steel construction and smooth, high-quality hinges ensure these will be your favorite shades for years to come. 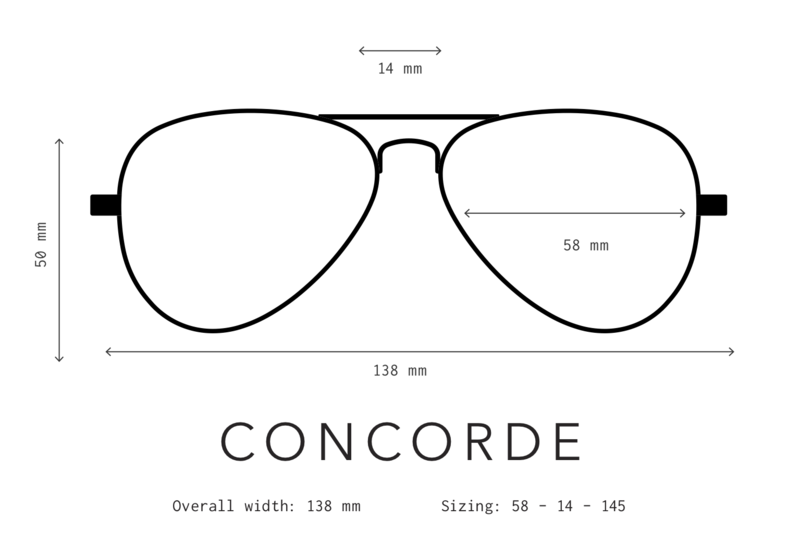 Design the Concorde to fit your style! History's most illustrious supersonic commercial aircraft, Concorde, represented a milestone in the history of aviation. It was an engineering marvel that redefined jet set. In recognition of this achievement, our Concorde collection is a slick take on the aviator glasses originally developed for pilots.